EMBL researchers in Hamburg and Heidelberg and their collaborators have studied a key protein involved in haemostasis, known as the von Willebrand factor (VWF). In a paper published in Blood, they report the structure of a key region of VWF known as the C4 domain. In a second paper, also published in Blood, a group from the University Medical Center Hamburg-Eppendorf (UKE) in collaboration with the Hamburg group reports on a clinically relevant mutation in the C4 domain. Matthias Wilmanns, group leader at EMBL Hamburg, and Janosch Hennig, group leader at EMBL Heidelberg, teamed up for a collaboration between two EMBL units with a focus on structural biology. Here, they discuss their findings. Why did you decide to study the von Willebrand factor? MW: In my group, we’ve been interested in understanding the elastic properties of proteins for a long time. We work mainly with long filamentous proteins in muscle. Remarkably, VWF has similar properties. In the past few years I’ve also been looking for opportunities to link the work we’re doing at EMBL with more clinical research. This has included an agreement with the UKE. I find the clinical aspects of this research very rewarding. In these studies you focused on a particular region of VWF known as the C4 domain. Why did you choose to study this domain? 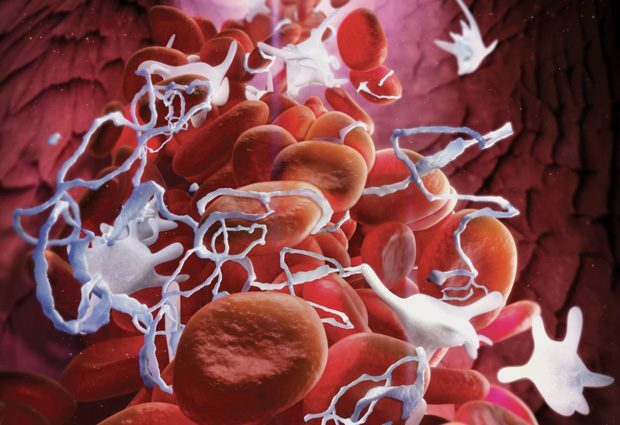 MW: The blood clotting process involves a cascade of biochemical reactions, and VWF is a key player in this cascade. It binds to proteins called integrins on the surface of blood platelets, assisting the process of platelet aggregation which causes a blood clot to form. The C4 domain is responsible for this binding to platelet integrins, which is what makes it particularly interesting to study. A number of gain-of-function mutations in the C4 domain have also been found as part of a large cohort study, coordinated by our collaborator from the UKE. Some of these mutations not only have effects on haemostasis but also lead to an increased risk of early myocardial infarction. Understanding these effects mechanistically opens up the possibility of developing new drugs to assist patients who have these mutations. How did you determine the structure of the C4 domain? JH: For this we used NMR spectroscopy, which is based on measuring distances between hydrogen atoms in a molecule. From that network of distances you can calculate the structure. The technique has limitations in terms of the size of molecules you can study – in general they can’t be too large – but the advantage of NMR spectroscopy is that it can be used not only to determine structures, but also to understand the interactions and dynamics of a molecule. It quickly became apparent that the C4 domain is very dynamic with flexible, moving parts. This makes it unsuitable for structure determination using X-ray crystallography, since it wouldn’t crystallise. However, with NMR spectroscopy we were able to determine the structure and obtain interesting insights into the dynamics of this molecule. You also studied a specific mutation in the C4 domain. Can you explain more about that? MW: We looked at a mutation that results in an amino acid in the C4 domain being changed from phenylalanine to tyrosine. JH: The structure demonstrates that this mutation does not change the way VWF binds to integrins. This leaves the possibility that it affects the contacts between the C4 domain and its neighbouring domains. During blood clotting, many VWF molecules arrange themselves into huge assemblies, so this mutation could affect the contacts between domains in these assemblies. What’s the clinical importance of this work? MW: Any clinical applications are still a long way into the future, but having data on naturally occurring mutations in proteins like VWF can be very useful in designing new drugs to counteract the effects of these mutations. Ultimately we would hope to work with the pharmaceutical industry to develop new clinical therapies to assist patients with health conditions related to blood clotting.